Positive Detroit: Capture Your Love For Detroit on Film For a Chance to Win a Year RENT FREE at Garden Court! Capture Your Love For Detroit on Film For a Chance to Win a Year RENT FREE at Garden Court! As a way to bring attention to the exciting, unique, creative and often unnoticed places and events in the city of Detroit, Garden Court Condominiums, Detroit’s premier high-rise living complex, is launching the first-ever “I Love Detroit!” video contest—asking the community to show their love for Detroit by capturing a video of themselves doing what they love most in the city. The announcement was made by Carrie Cohen, Sales Director for Garden Court Condominiums. Beginning May 23, participants can upload their 2-minute video submission to www.gardencourtvideocontest.com. First, participants must create an account, then click “submit video” to upload their submission. The contest will conclude on Monday, June 21, with the winner of the contest being announced at a “Wrap Party” happening from 6-9 p.m. on Tuesday, June 29 at the luxury rooftop at Garden Court Condominiums overlooking the Detroit River. At the event, the winner will be announced and awarded the grand prize to live rent-free at Garden Court Condominiums for one year. 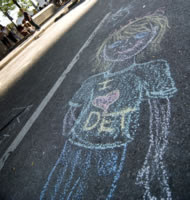 During the year, this individual will subsequently chronicle their day-to-day experiences participating in Detroit’s culture, dining and sporting events through a blog. The blog will offer those considering a move to the city an unprecedented birds-eye view into the amenities that living in the city of Detroit can offer. A panel of notable southeastern Michigan-based personalities will select the winning video. Participants can submit their videos and view contest rules at www.GardenCourtVideoContest.com between May 23 and June 21. FOX 2 News is serving as the “I Love Detroit!” video contest’s promotional partner and will showcase video submissions on-air during the duration of the contest. Designed by famed architect Albert Kahn in 1915, Garden Court Condominiums is a mid-rise condominium complex located in the East RiverWalk District of Detroit with spectacular views of the City and the River. It features 65 superbly renovated residences that seamlessly blend the beauty of the historic architecture with today’s modern amenities. For more information, please visit: www.gardencourtcondos.com.